Hello, and happy Friday! Our remodel (new floors, paint, new lights, and more) moves along slowly. The floor is in the hallway, kitchen, dinning room, spare room, baseboard is going in today. Now we have to get the painter out to paint the hallway and dinning room (which means I also have to empty out two closets). 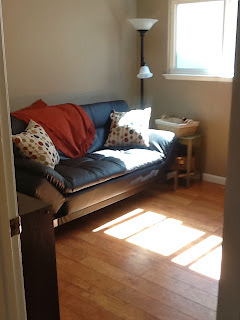 Then we will need to get the floor in our bedroom (anyone who would like to come over this weekend and pull up carpet with me is welcome to do so lol), then the family room. 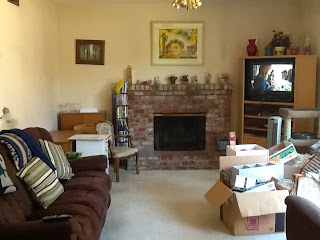 Of course then the kitchen, family room and our room will need to get painted, new light fixtures installed and we are going to install recessed lighting in the kitchen, so that has to be done (including the shopping for the recessed lighting). Oh, and we are trying to get a new cabinet in the kitchen as well, waiting for some estimates. 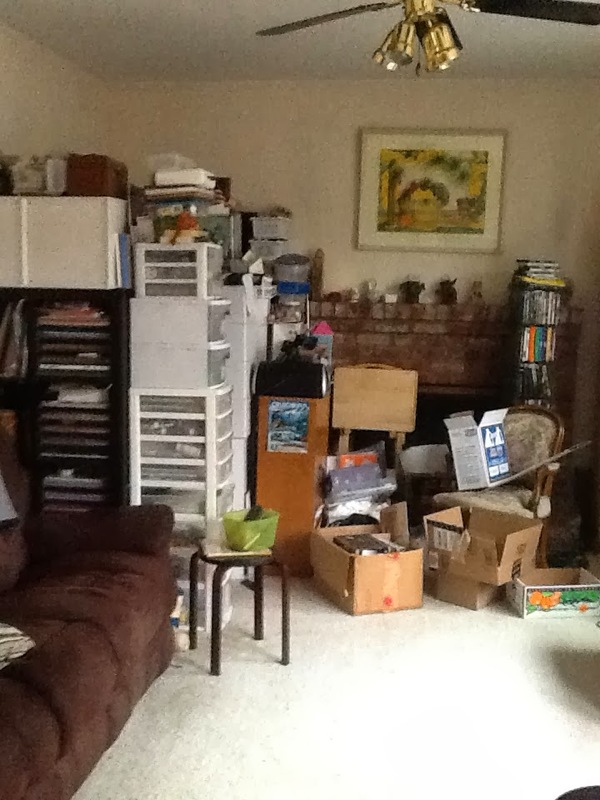 Our house is in total disarray, and my mind is not far behind. When all is done there will be pictures. We cannot afford to redo the kitchen, so we are going to paint the cabinets, and hopefully get one more cabinet with a built in table installed, minor fixes for a very small kitchen. Anyhow, that is not why you stopped by is it? Needless to say I have not been crafting much, have been working on a afghan since it can be picked up and put down. This is my draft card, may make a few changes but will not change that much. The stamp is from Hero Arts, "Dot Flourish Border," and it sort of reminded me of branches with berries, like holly. I used silver embossing powder that has some glitter in it and then thought that filling in the dots with red glitter would add some bling, and color, and the red paper added that little bit of zing as well. Used a "Peace" ( may change the silver to red embossing powder for "peace"), stamp and will use a stamp for the inside sentiment "May the peace and wonder of christmas be with you always." Note that the buttons are not even in "Christmas colors" What a great idea! How cool is that! You could use any number of shapes, including small flowers, leaves, and just make sure to put them on the card in the shape of a tree. And think of all the cool paper you could use too. Really loved this idea. 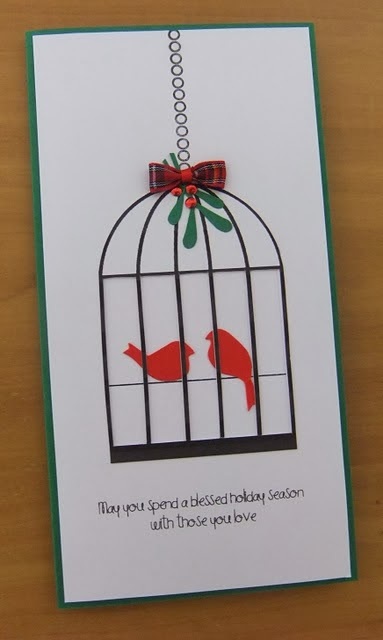 This person used a branch die cut, the word "joy" and a nice embossed background, so easy, elegant and all using images/die cuts that are not Christmas specific. 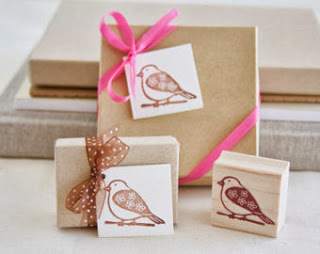 Using a bird on a branch stamp makes for a very nice card, and once again the image is not Christmas specific. Actually any "winter" scenic stamps would also make a lovely Christmas card, especially with a few additions of "snow," or other winter type decorations. OH MY! You really have to spend some time on Tilly's blog, you will be floored by her creativity, her most recent posts have some really cute fairy garden creations, keep going back to find some absolutely mind blowing cards. Here is one of them (found it on pinterest, did not see it on her blog). Here she took a bird cage, two birds, used the red, brought in some leaves, berries and added a red and green plaid ribbon, and wow! 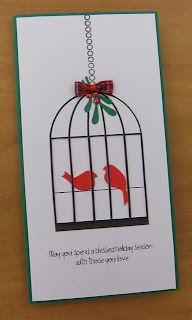 Wonderful way to take existing die cuts and make them into something for Christmas. You could use a dotted embossed background instead of the snowflakes, or just put some glitter on for the background, in a falling snow pattern. None of the papers are "christmas" papers, nor is the ribbon, just the "Merry Christmas" is used to turn this card into a Christmas card. 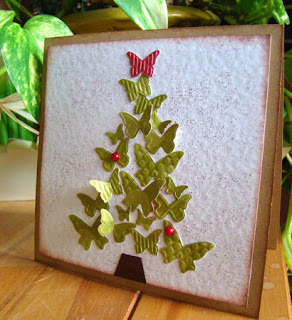 Here is another card using scenic stamps, just trees. Lovely, and the light blue brings in the feeling of winter. Love the specks of gold, reminds me of birds flocking together. So many ideas on creating holiday cards without having to have a specific holiday stamp, hopefully today's post will inspire you to use what you have and come up with a great card. Have a great weekend everyone! Hoping to be able to post again next week, but it will all depend on how the work in the house is going, keep your fingers crossed. And if you have ideas on creating Christmas cards without using Christmas specific stamps or dies, please make sure to leave a comment. Thanks for following me all these years, and don't forget I absolutely LOVE to hear from you, if you have a moment leave a comment (or two, or three lol). Our house is still torn up (installing new flooring in the hallway, dinning room, family room, kitchen and hopefully our bedroom as well, and then painting). And even though we are not doing anything "major" it seems like there are so many choices to make! What color for the walls? Accent wall or not? New lighting fixture for the dinning room/hallway, bronze? Brushed nickel? Fan for the family room, white? Brushed nickel? What fabric for the dinning room chairs? Should the chairs be painted or left as is? What about the dinning room table? Paint or just try to fix it up a bit. And new artwork/decor for the walls. Have pictures for the new craft room that I have to get frames for, and the rest of the house needs tons of updated decor as well. Anyhow, am looking forward to getting everything done, will post pictures as things move on. My collection of stamps includes many of those tiny little stamps that come with sets, and most of the time I forget to use them, or they get lost. The reality is that those tiny little stamps can do a whole lot of creating for you, if you know some fun ways to use these little gems. 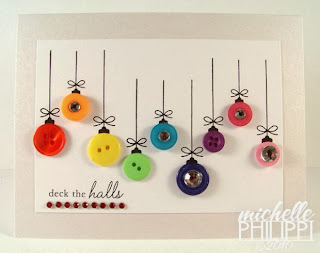 When using the small stamps remember the elements of design, here is a good link I found from Mel Stampz (she has GREAT stuff on her blog by the way). When using small stamps overall design components become even more important as you do not always have that one large image to design around. Another GREAT place for ideas on what to do with small stamps is Stamps by Judith. 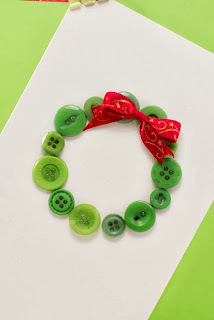 Many of her stamps are the "stubbies" or "sticks," tiny stamps that allow you to create wonderful wreaths and more. 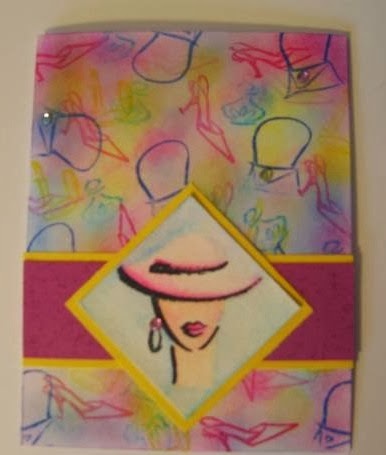 Tapestry also has some peg stamps, check them out here, and they have tons of ideas as well. Nona Designs has some inchie stamp ideas click on the various cards for complete list of how to and supplies. 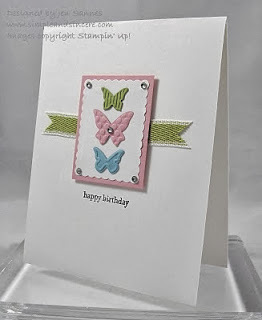 Here is a link to a few more cards on Pinterest using small (inchie) stamps. You can also visit Inkadinkado for ideas (see below) and to purchase the Inchies stamps. 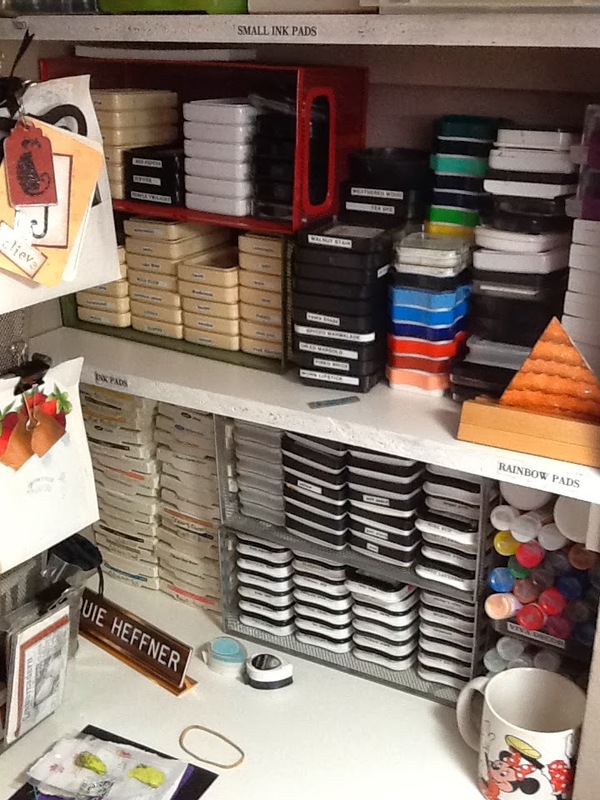 And, there is a new product that I really want to try, the Sizzix Framelits Die set, square flip it. 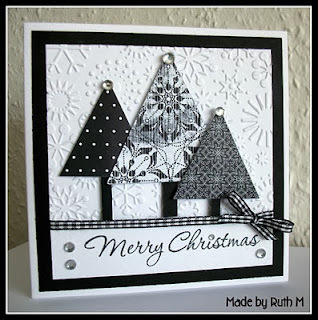 LOVE the idea of having all the pieces cut out all at once, and you can use your small stamps with the cut outs. Once again Jennifer McGuire knocks my socks off, she is really amazing. And this post by her is nothing short of genius. 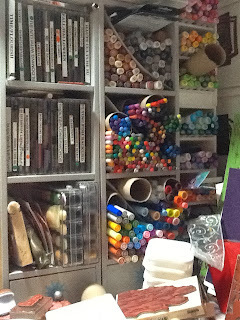 I LOVED the fact that she made her own coordinating paper (how often have you found that you have 12 million different colors of cardstock, but not ONE matches what you are doing?) Great post and if you have not bookmarked her blog you should! Also, you can subscribe to her on YouTube so you will not miss any of her wonderful videos. Have you seen the new punch boards from We are Memory Keepers? I have the new envelope board (have not used it yet), and LOVE these other punch boards which can make gift bags and boxes, way cool. Fiskars Intricate Punch: Mmmmmm.....this looks so nice! Of course I want to get one : ) but...that means I have to get rid of something because that is my new rule, too much stuff and I am not going to overstuff the new crafting area lol. What do you think of these new punches? And WOW! Love how this card is put together, especially how she shaded using the Inktense pencils, am going to have to play around with some of the mixed media stuff I have in the craft area. 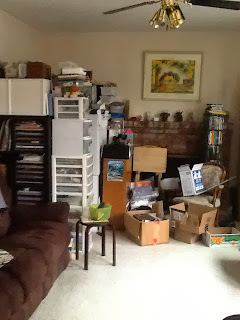 Ok, that is it for now, hoping to be back again next week, but may have to wait a week if our house stuff gets in the way. How time flies :) New Crafting Area and a few links. Hello! Yes, I am back again. And yes, it has been quite a while since I posted. Life has been busy, new job, family time, and some work around the house. Have missed posting here, have posted a bit more on the Facebook page, though not as much as I would like. Hoping to change all of that from today onward. Was dreading moving everything, just too much stuff! And yes, it was every bit as bad, actually worse, then I thought it would be, but the end result is oh so wonderful! This is the new sofa/sleeper for the room, called a "EuroLounger." 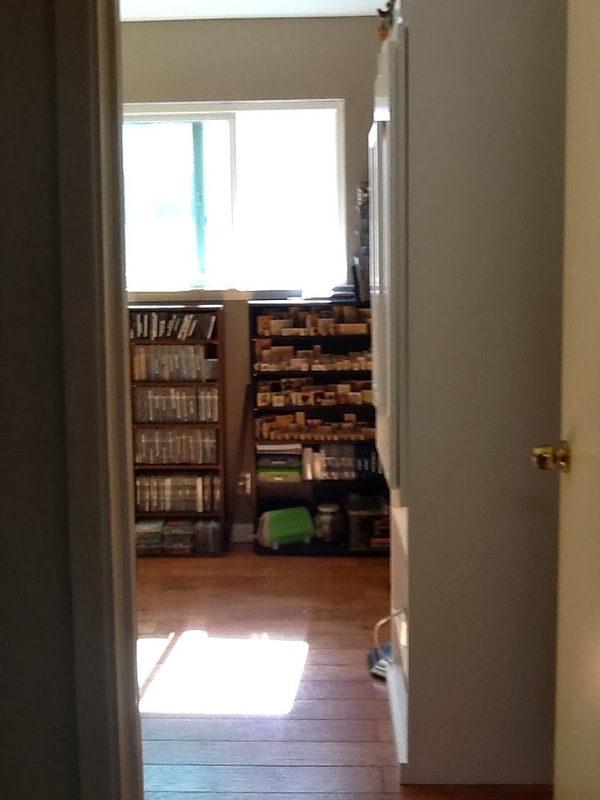 This is a view of the room from the hallway. We removed the carpet and put in new flooring (which we are also installing in the hallway, dinning room, family room and maybe the kitchen). We also repainted the room, the walls are a taupe (the inside of the closet is taupe, just a shade darker), and the ceiling/molding is an off white. 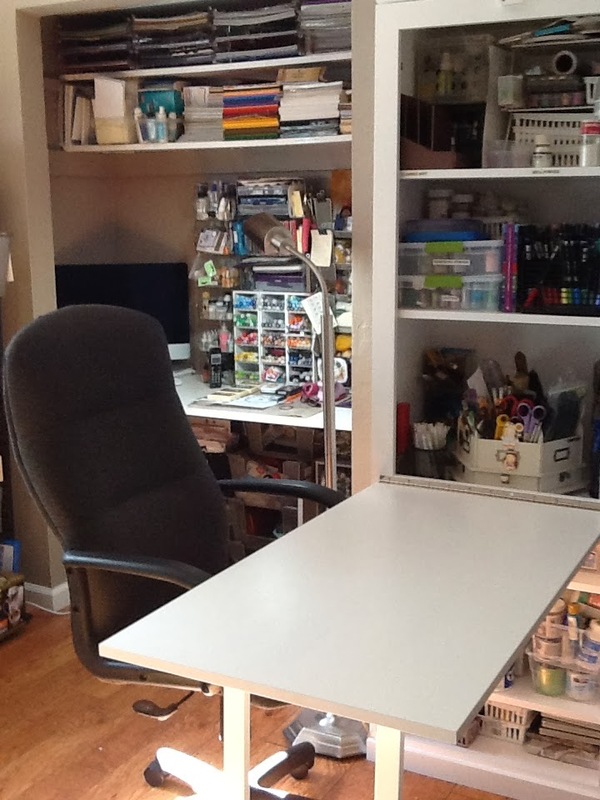 This is the other side of the room, new white cabinet :) and crafting area. This is part of the crafting area, we took out the closet and put in a desk top (cut down some wood to fit the closet) added a few more shelves. 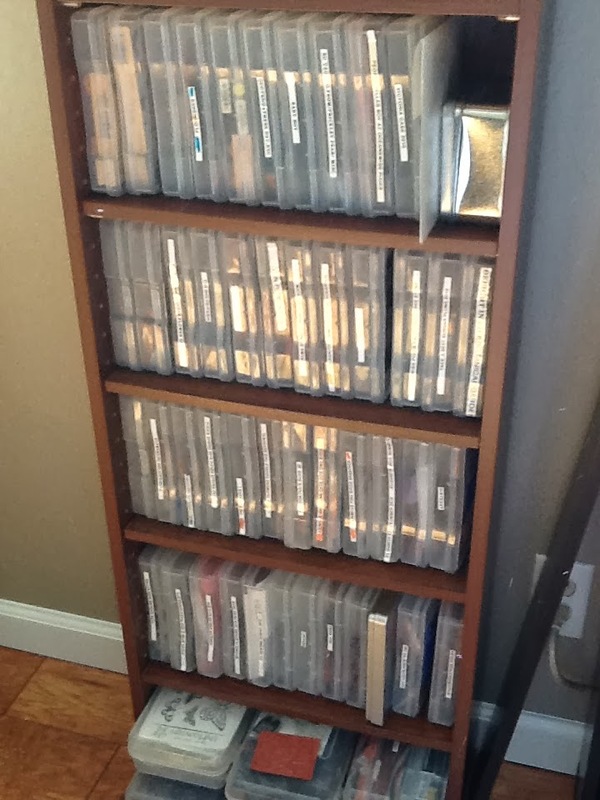 Ordered a larger DVD shelf unit (on the left in the picture) for stamp storage ($38), works perfectly. Had a smaller unit (next to the larger one) that I am using as well. 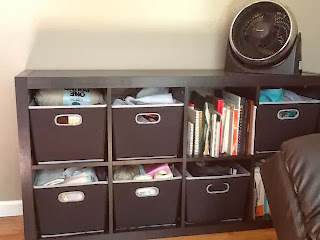 Here is a close up of the baskets from Bed, Bath and Beyond (the top basket is not a new one, just the ones below). 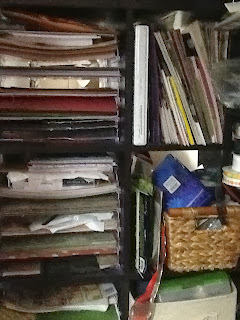 I love how they stack, lots of room and they are very sturdy. These are on top of the new large DVD storage unit, smaller ones are on the desk, and large ones are underneath the desk. The peg stamps are stored in metal CD storage, I can move the container easily, or just grab stamps. 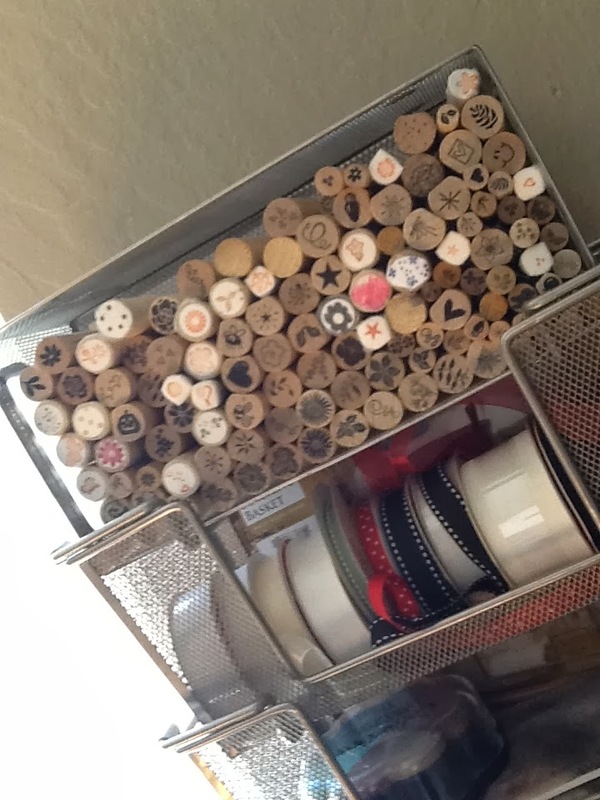 The bottom basket has clear blocks for unmounted stamps. 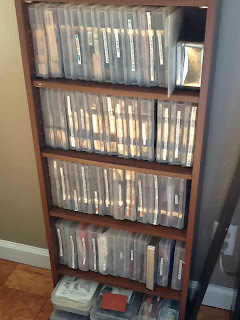 This is the smaller DVD unit next to the larger one, had this in the old area. 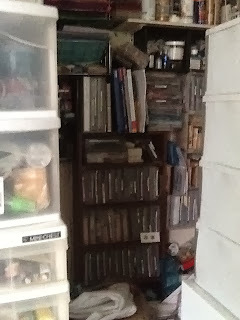 Still have one more shelf for the larger unit, (you can see the shelf next to the plug), not sure if I need it or not, but will keep it for a while. Here is a close up view of the ink pads and how I have stored them. The shelf above the ink pads also holds H20's, small ink pads and glue dots/mounting tape. On the far right, bottom, behind the coffee cup, are Viva Decor pens. Here is a front view of the new cabinet, took me forever to find exactly what I needed. What I love about this cabinet is that the door on the top can swing open, or it can fold down into a table, see below. Top shelf of the open storage has Martha Stewart punches, middle shelf has glue, baby wipes, modge podge, embossing paste and so on. 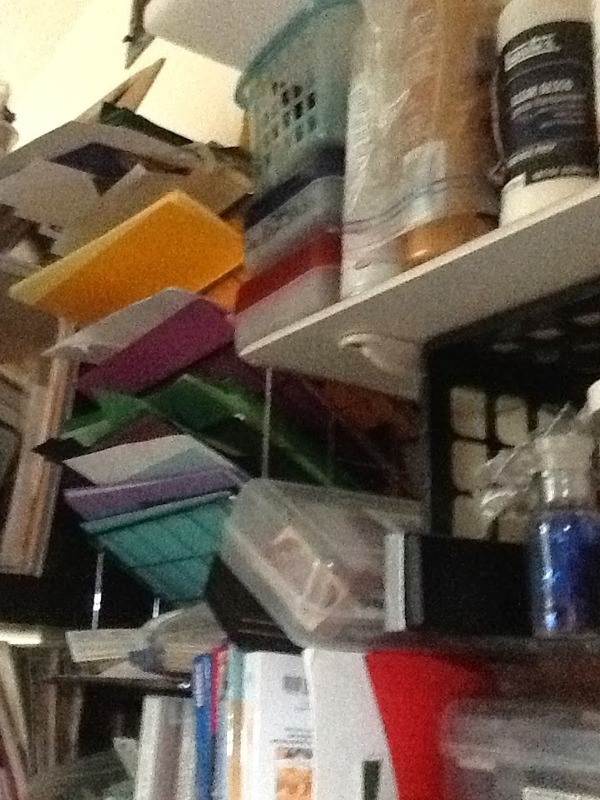 The bottom shelf has water color paints, chalks, and some special paints. 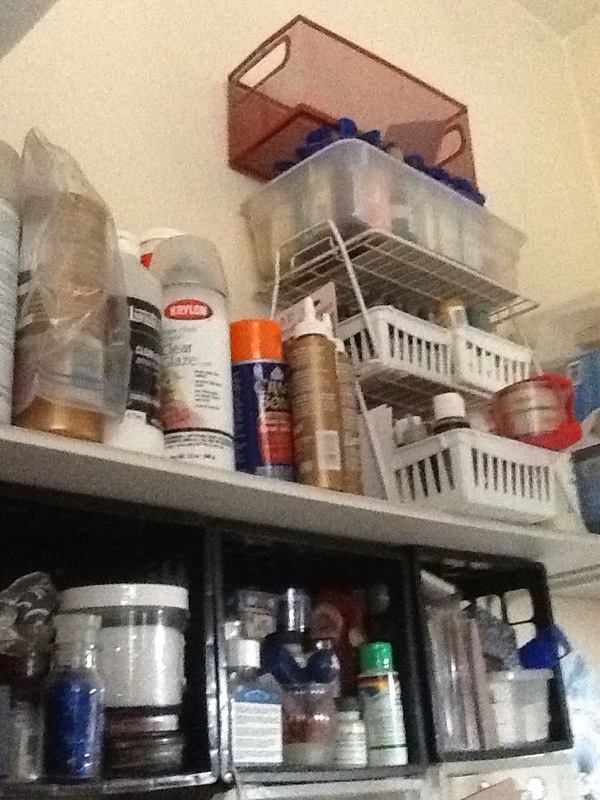 Here is the door open, on the top shelf I have glimmer mists (on the left), mica powders (on the right), some clear glitter and a few odds and ends. The middle shelf has embossing powder, glitter, (in boxes on the left), markers, colored pencils, water color pencils, intense pencils (in utensil baskets, on the right). 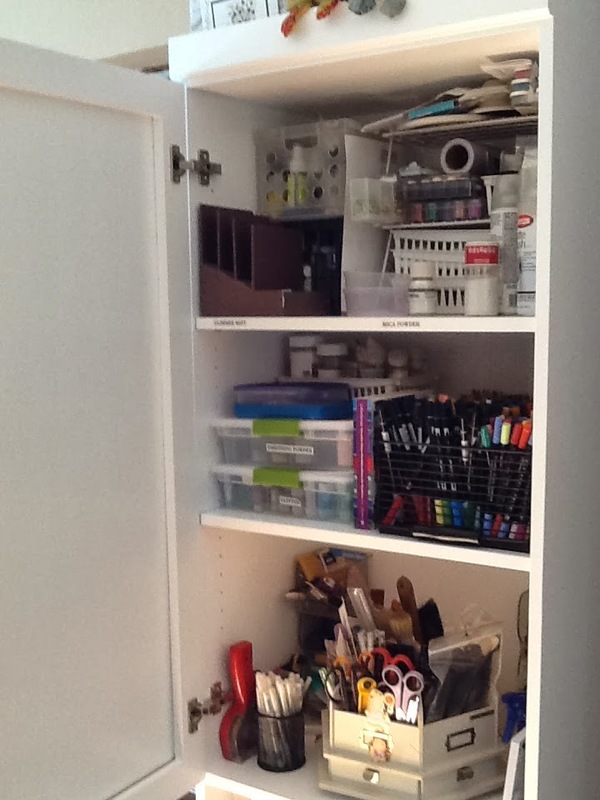 I wanted to be able to grab all of the markers or colored pencils at one time and thought that the utensil holders would work best, bought the holders at Bed, Bath and Beyond. Bottom shelf has the tool turnaround, and tape gun, and a few other odds and ends. Here is the tale top down, with the chair. 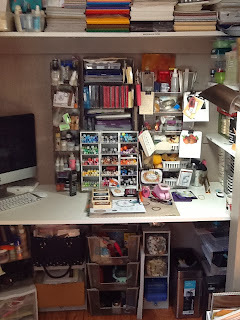 My old area was very cramped and the work area very restricted, this new set up allows me to spread out, a dream come true lol I will be able to set up the cuttle bug and not have to stop to put it away to continue working, same for the paper cutter and so on. 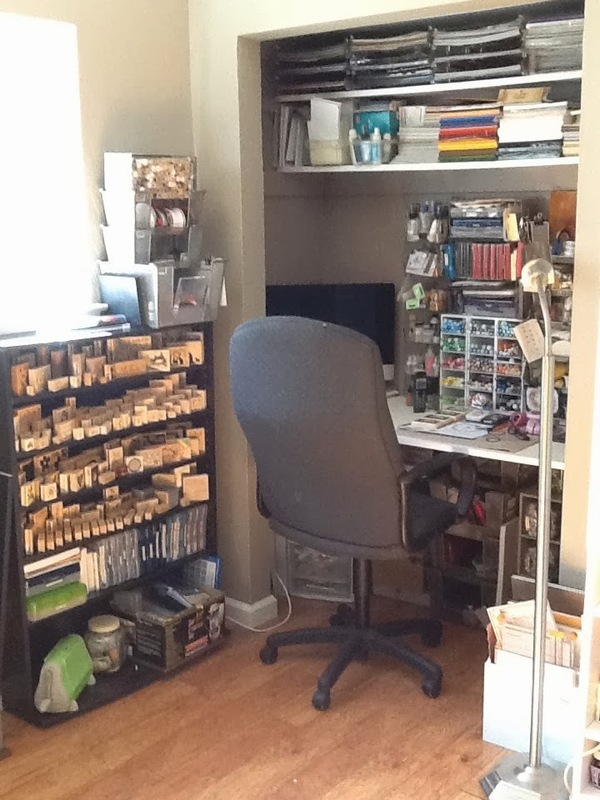 So far I have just been playing around and mainly using the desktop in the old closet (no time for crafting as the rest of the house is being worked on). I can leave the table down or when we have guests spending the night close it up. 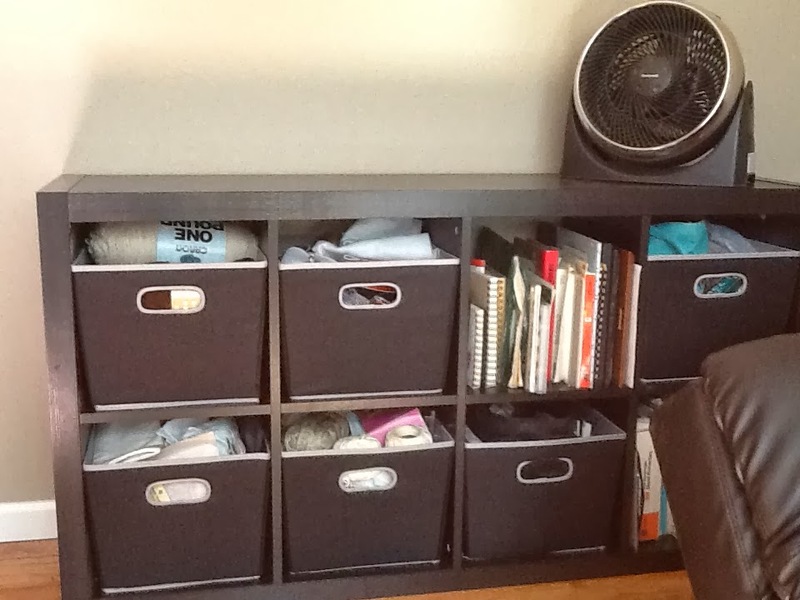 This is the unit that was in the old crafting area, we turned it on its side and bought baskets. 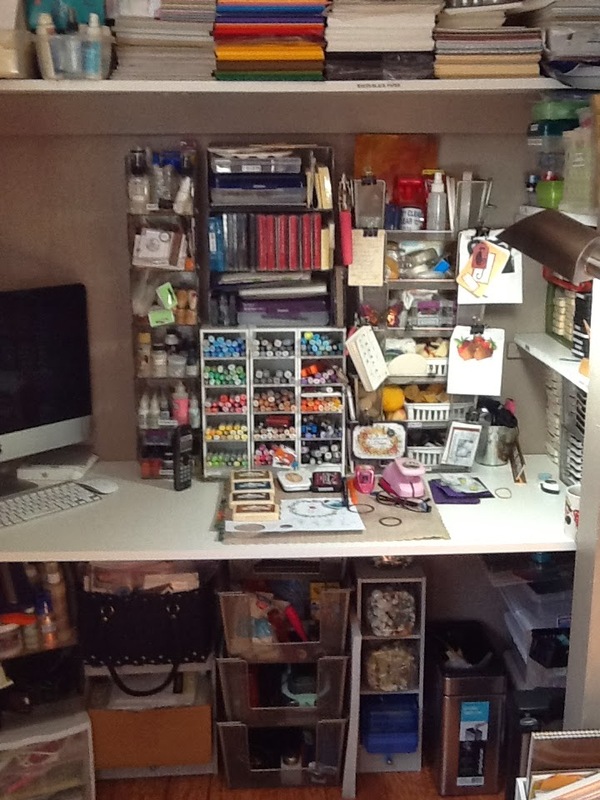 Using it to store odds/ends, yarn (am now crocheting), embroidery supplies, zentangle supplies and eventually we will have a tv on top. And here is the family room, minus the crafting area lol. See the boxes on the right? That is about half of what was purged, will be donated soon. 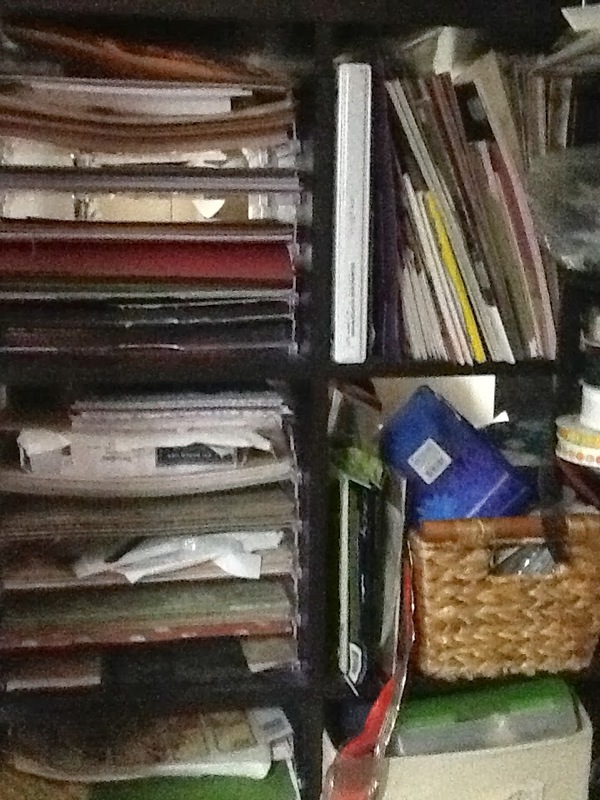 Still need to donate/sell the items on the left (white drawers and my old sewing/crafting table). The oak unit with the TV is going as well, we are planning on putting a TV above the fireplace, as well as putting in new flooring, new fan and painting. 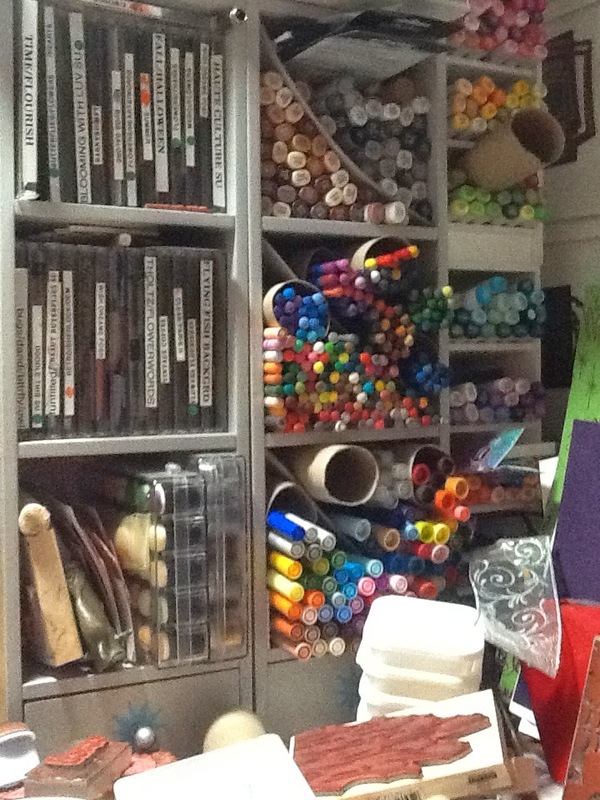 One thing I learned, crafting is an addiction, and while I did manage to pare down and get rid of about a third of my stuff, there are still things I can get rid of from the move, and I will soon. Looking forward to posting again, there are just so many GREAT things out there to post! And of course I am on Pinterest (my god one can spend a great deal of time on that site!). Missed you all, and missed the blog! Looking forward to being back. Bigganded's blog: WOW, WOW, WOW! Have seen her work on SCS, went to her blog and spent hours (yes, hours) admiring and casing for my own projects. Truly an inspiration and an artist of the highest level, you will enjoy every moment of her blog and projects. Interesting Rainbow business cards: found the site through pinterest, and though it is not in English all of the directions can easily be followed because of the pictures. Really want to try this soon! Happy Friday! We had a great visit last weekend with our son who is stationed at Camp Pendleton, time went by far too fast. Hoping that he can come home over Memorial weekend because seeing him just makes us miss him all the more. The only downside to visiting our son is the traffic through Los Angeles...just horrible, horrible, horrible, have NO idea how people live with gridlock like that every day. AfterHoursStamper was featured on a blog called Be @ Home Decor Blog as a Best of the Web! I am very honored to have them feature my little blog, and if you get a chance check out the other links on their Best of the Web, lots of cool sites and great information such as their "Tip Center" which provides some good tips on various topics. Enough of the small talk, lets get down to business : ) This week is all about coloring, from copics to water coloring and more. I tend to color my images a variety of ways: colored pencils, water coloring, copic/alcohol markers, ink, dye based markers, chalk, and so on. 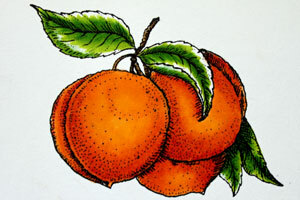 Each coloring technique has its pros and cons, some are easier to learn, some require special paper, some require expensive coloring supplies, all of these technique give you a different look to your stamped image or background. All of the links today are about coloring mediums and also how to color your images using various mediums. In no way is this list complete (it seems like every week there is a new product you can use to color images) but it will hopefully give you the inspiration to try some new coloring techniques with the supplies you already have on hand. Before we get to the coloring there is one important facet to review. Any of these coloring techniques are going to look best if you make sure to create dimension in your coloring. To create dimension you need to make sure to add shading to your image (darker areas) as well as make sure to leave some white/light areas. Here is a very good link that goes over basic shading (and also has links to a number of coloring mediums). Also, you should try to add some outline color/grounding to your image. Add a light shade of color around the image for added depth. Don't leave your image "floating" on the page, "ground" by adding a "floor" to the image directly underneath. All you need to do is add a swatch of color, green, brown, even grey, to give your image something to stand on (grounding). If you are coloring an image and do not like what you see, take a moment to ask yourself how your shading is. Are there dark and light areas? Is the blending smooth? 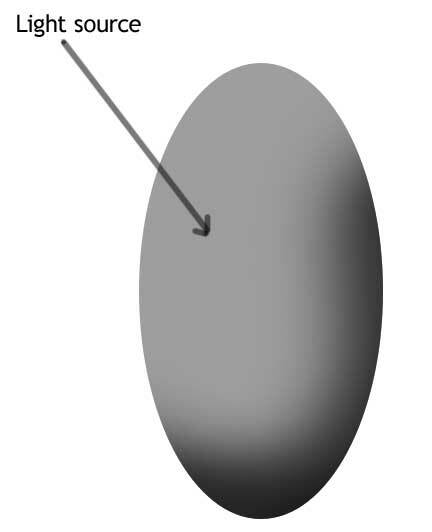 Do you have a light source so that your shading makes sense? Is your image grounded? Do you have shading around your image? If you don't like what you see try to darken areas, or add some white to the image (it is usually easier to go darker than it is to make your image lighter). And remember that practice makes perfect. You might sit down and color images and not like one that you did, however if you keep on practicing, reading tutorials, watching videos, your coloring will improve. Set aside some time just to practice, stamp out one image a number of times and play with your coloring, vary the light source, vary the intensity of your coloring. I promise that if you do set time aside to practice you will improve! (depending on the set you buy you can get these for as low as $1.54 per pen) versus the Copics ($5.24 for the Sketch and $3.59 for the Ciao) makes it hard not to at least try the Spectrum Noir (which I am planning on doing in the near future and will have a product comparison for you as well). Once you have alcohol markers you will discover that there is a learning curve with these pens, and it is critical that you use the right paper and stamping ink (I have posted on these two items before). Once you have the right paper and stamping ink you will need to practice, practice, practice to be able to get flawless blending. 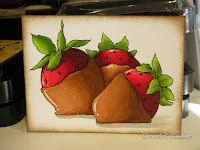 Here is a GREAT tutorial (with a free digital image) from Dove Arts Studio on how to color using your alcohol markers, and yes, I am planning on printing out the image and following the tutorial as well (remember that when you print out an image to color you need to make sure your printer ink is dry or you will have bleeding from the printer ink). Dove Art Studio also has a very good starter list of copics, really like how she put the colors together on a chart. 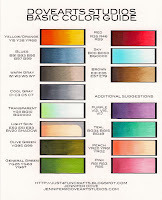 And how about a free chart for coloring hair and skin with your alcohol markers? Loved this, and it is VERY handy to have (always write down the combinations you use so you can duplicate your work). You will need to create an account (free), but the chart is well worth the few minutes it takes to sign up. 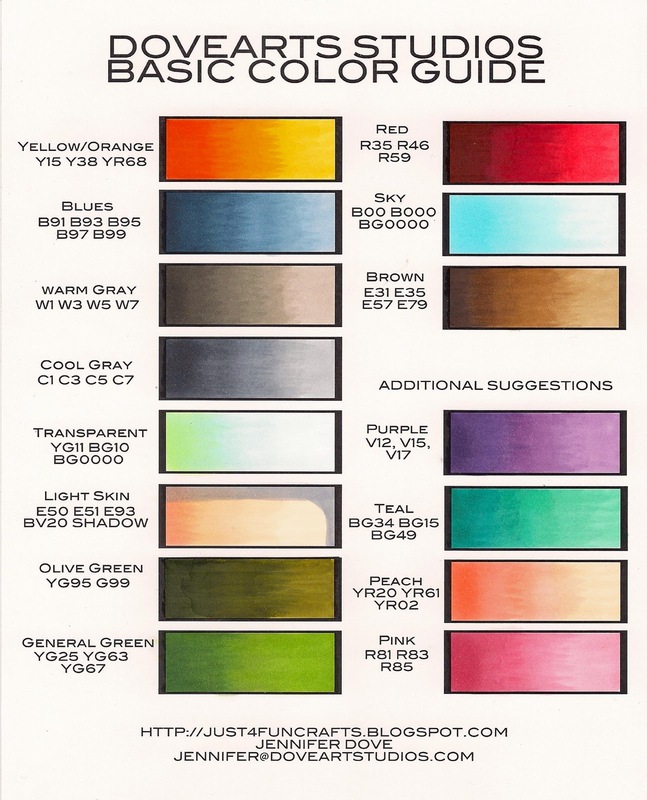 Don't forget that you can also search for all sorts of copic coloring on Pinterest. One more resource link, lots of information here to savor and enjoy. Colored Pencils: Using colored pencils can be a great way to quickly color your images with wonderful results. Most of you are aware of using your colored pencils with Odorless Mineral Spirits (OMS), an easy technique that gives some very good results. Colored pencils are cheaper than alcohol markers which means you can afford to buy more colors! There are many different brands of colored pencils, some are wax based and some are oil based. The oil based pencils, in my opinion, are much easier to use because you don't get what is called "wax bloom" from the wax based pencils. I use the Faber-Castell Polychromos and absolutely LOVE the way these color. Colored Pencil Resource: This link has TONS of information on using colored pencils (I have linked here before). You will find basic to advanced techniques here, as well as tutorials and videos, just an overall great resource to have. Dye Based Markers: These markers are dye based and water soluble which means you can lay color down and then work the color with water (a water brush or paint brush dipped in water). You can also color your stamps directly with dye based markers, or you can color your image without using water. If you plan on using water the best way to use these markers is on water color paper, 140 pound is preferred (you will find your ink blends much better on 140 lb versus 90 or 120 lb). You can also use your dye based marker to create a paint pallet, simply scribble some color on a nonporous surface (craft mat or cd cover, etc.) and than pick up the color with a paint brush and add directly to your image. 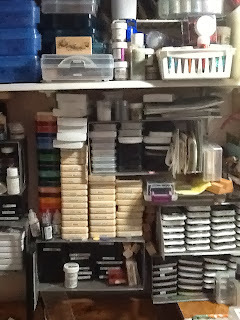 There are many different manufacturers of dye based markers, my favorites are Tombow and Memento. Tim Holtz has the new Distress Ink Markers (I have two and haven't used them yet). 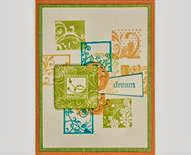 You can also watch videos by Stamps by Judith to see how to color your images without having to use water. Water color/ink pencils: Another great way to color your images. You can buy water color crayons, pencils and another product called "Inktense" (this is a ink based rather than water color product). I use both and love the Inkense. When using the Inktense you need to remember that when the color dries you will not be able to re-wet and move the color around as the pencils are ink and when they dry the color is permanent. You can use water color pencils to color directly onto your image, or you can use a wet brush or blender pen to pick up the paint from the pencil and than lay the color down on your project. Either way you will get some wonderful results. Again, make sure that you use at least 140 lb paper for the best results. Here is a nice tutorial on using water color pencils. Dye based ink pads: Yes, you can also use these to color your images. All you need to do is get some of the ink onto a nonporous surface and than pick up the color with a water brush or blender pen and color like you would using any water color medium. Chalk: Again, another versatile way to color your images (and also use on solid images). You can color your image directly, you can stamp a solid image in versamark and apply chalk over the image, you can stamp on dark paper and color with the chalks, you can use a blender solution to help the chalk blend or you can do a "double" chalk method by coloring your paper with chalk, stamping an image with versamark, and then applying more chalk! Chalking is also a great way to color images you emboss with brass stencils. After you have embossed (or you can just use the brass stencil to color without embossing), keep the brass stencil in place and color using your chalk. You will get some wonderful results! Here is a link to chalking techniques from SplitCoastStampers . Whew! And as I said before, this is not a complete list of ways you can color your images (we didn't even go over using gel pens, crayons, glitter, you get the idea). Hopefully you will try something new, or pull out some supplies you haven't used in a while to color your images.